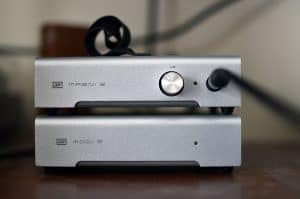 HomeHeadphone ComparisonsAKG K612 vs. K712 | WHAT’S THE SCOOP? The AKG K612 vs. K712? Inquiring minds want to know! Before we get started, grab a snack, sit back and relax because.. The K612 is a superb entry in the AKG line and flies under the radar like the 712. It has great tonal balance, with a crisp, clear, well defined sound. The bass is tight and controlled without being overly boomy. These along with the 712’s both have significantly more bass than the K701’s. As for the mid-range, it’s smooth and slightly warm, with vocals coming across very nicely. This is a headphone that does very well with a multitude of genres, much like the K712. It’s also heavily endorsed for gaming and movies. They give a dimension to your music that will have you really smiling as you go back and listen to all of your old albums. There is a detail and clarity here that is remarkably impressive. Hands down, you will want to purchase separate amplification to power these. The JDS Labs 02 does well here. To be quite honest, If you’re looking for a headphone that will sound good plugged into your laptop or mobile device, I would steer clear of these. The 612 definitely needs amplification to shine. Both the 612 and 712 do well with similar amp setups. I go into a bit more detail in the K712 review! Multi-Genre. They also do well with all kinds of music. Very similar to the 712 in that regard. These headphones are pretty highly regarded, although they kind of fly under the radar. The bass response is full, accurate, and tight. The K712 has more bass than all of it’s predecessors and siblings, The K701, K702, and Q701. It’s still not exaggerated though, and remains focused. Like the Rock. FOCUS! 😀 Know that both the 612 and 712 are open back headphones that will leak sound. Great Sound-stage with a phenomenal sense of space. It’s improved upon and no longer abnormally wide like the earlier K7xx models. One person even said that his online gaming community tried to have him banned because he could hear the enemy from so far away, giving him a distinct advantage over his opponents. Bass-heads. Yes it’s bass is quite impressive, but I wouldn’t get this headphone solely for Rap/Hip-hop (or anything bass heavy). They both have a similar look and feel. Both are open back and leak sound. Both are great for gaming and movies, and excel with many genres of music. Both need an amp for optimal sound, and do well with similar set-ups. Both are said to require some amount of burn in time before they reach peak performance. Impedance. The K712’s have a 62 Ohm impedance vs. the 120 Ohm of the K612. I wouldn’t be too overly concerned about the difference here. Know that you should invest in an amp with either. AKG headphones in general can be a little deceiving because of the low impedance ratings in a lot of their studio entries. The K701 for example also comes in at 62 Ohm, and also heavily relies on amplification. Chord. The K612’s do not have a detachable cable while the 712’s do. Color. The 612 is mostly black while the 712 has hints of orange. The K712 is good for classical and jazz, but the 612 may not be as good. This is a very subtle difference, and both are great for a wide variety of genre as discussed previously. Origin. The K712 is made in Slovakia, while the K612 either comes from China or Austria. There are basically 2 models of the 612 that you should be aware of. Sound. The K712 may have a smidgen more bass and treble detail than the K612. The sound is very similar overall however. Padding. The 712 has memory foam vs. the velour of the 612. Well, this is a tough call. If you aren’t too concerned about the non-detachable cable, I would say go for the K612, as it’s a lot more affordable and you can use that extra money on proper amplification. It’s also an extremely similar headphone to the 712, but some say it’s outclassed. CHECK OUT THE AKG K612 ON AMAZON!! On the flip side, if you do require a detachable cable, the K712 may be a better option. Outside of that glaring difference, there isn’t much that’s so significantly improved on the 712 that warrants such a huge price difference. Some say it’s outclassed, but what does that even mean? You also may get a little more bass and treble detail in the 712. Not satisfied? Looking for the absolute best in terms of mixing/reference? Look no further than the Sennheiser HD 600. It’s been called the Gold Standard, and serves as the benchmark to which all other headphones should be compared. CHECK OUT MY IN DEPTH SENNHEISER HD 600 REVIEW!! Well that’s about it for today my friend! I hope you’ve come away with some valuable information on the AKG K612 vs. K712. Questions? Comments? Requests? Did I leave something out or get something wrong? Leave a comment below or Contact me!! Which of these headphones are you more likely to go with? I would love to hear from you..
I’ve really been enjoying these comparison articles and this one hits the spot. My oldest boy’s B day is coming up soon and like me, he takes his gaming pretty seriously. The AKG K612 headset sounds awesome and I can’t wait to see his face when he opens these babies up! Thanks for keeping us in the know Stu and kudos for another great review. Nice man! That’s awesome. Yeah it’s funny because you wouldn’t think a lot of these headphones would be good for gaming, since they were meant for reference/mixing applications. But then again it makes sense; if you can hear all those subtle details when you’re mixing down a track, why wouldn’t you be able to hear the subtleties that come with video game sounds as well? I think it’s pretty cool, and you definitely made a great choice. The K612’s really get stellar reviews when you start digging around the net, and in some cases they’re actually preferred over the 712’s! I’m sure you took this into account in the decision making process. 🙂 I appreciate your continued support and encouragement. Please let me know how your boy likes the headphones too! I was very much considering them.. I was wondering if there is any other headphone that could work a bit more multi-genre than the Akg K612 at its same price, not just for listening but also for producing, thanks a lot and God bless you too! The DT880 is a little more, but is in my opinion the second best headphone for mixing behind the HD600. Can’t go wrong! Also the AKG K550 is awesome as well. Let me know what you think and if you have any additional questions! Is there any other open back headphones that I should consider in that price ratio that offers linear frequency response at low volume? The Sennheiser HD598 sounds like it would be right up your alley..
Hey Stu, I’ve heard on a comment that the AKG K612 final mixes will end up sounding dull and overly bass heavy in the studio monitors owing to the enhanced top end and restrained bass of the cans, could it be true? If does, what will happen to the AKG K712 considering that both have pretty much the same frequency response? Ty Stu! I mean that could be true, but if you have a good understanding of mixing, you’re not going to over do it. A good bass should have a little compression and limiting so as not to have it bleed out. Most good mixing cans will have a bright treble, it’s just the nature of how they’re designed. It’s really about finding a good balance inside your software and adjusting accordingly, and less about the actual headphones. It looks like now the AKG K712 is also made in China, do you think it is still worthy? Yes the K612 is a very good headphone. Not everything that’s made in China is automatically bad, though some products are. I find that the Chinese do pretty well with condenser microphones and headphones. Is the quality as good as the Austrians or the Germans? No, and that’s the trade-off that we have to be willing to make sometimes.